ID Keys: Red stripe on back of head, black and white barring on back. Red-washed belly usually very hard to see. 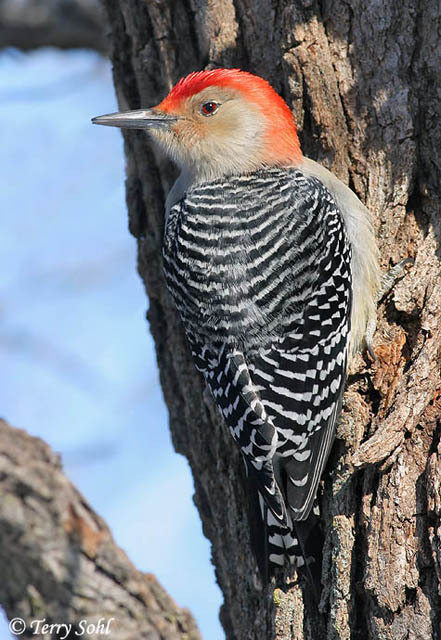 The Red-bellied Woodpecker is an often noisy bird that has adapted to living in residential areas and parks. Despite the name, it's usually very difficult to see the reddish wash on the belly. The red stripe on it's head is a much more obvious identification feature. The red on the head extends all the way from the forehead to nape on males, while the females only have red on the nape. Habitat: Floodplain forests, woodlands, groves, orchards, towns. Diet: Omnivorous. Eats many insects, but plant material may make up half the diet in some seasons. Behavior: Foraging primarily occurs while climbing on tree trunks and branches in search of insects. They will also fly out from perches to catch insects in flight. During parts of the near, seeds, nuts, and fruit can make up a significant portion of the diet. They nest in cavities, often competing for the same nesting cavities as non-native species such as the European Starling. Nesting: May and June. The nest of a Red-bellied Woodpecker is a cavity they themselves excavate in a tree, or sometimes in a man-made object like a fence post or telephone pole. The female usually lays 4 or 5 eggs, and both parents help to incubate them. When the eggs hatch, both parents help to feed the young. The young fledge after 3 or 4 weeks, but typically remain near the parents for several weeks after fledging. 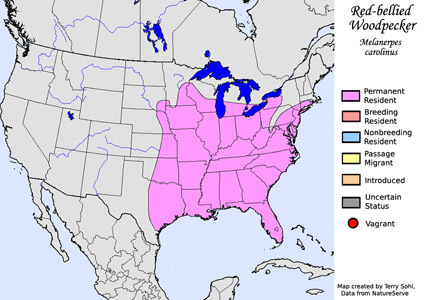 Migration: Not migratory, although some wander in the fall, especially juveniles. Similar Species: Distinctive in South Dakota. Similar in appearance to Golden-fronted Woodpecker, with some range overlap in Texas. Also similar to Gila Woodpecker, found in the desert Southwest. Conservation Status: Seems to be increasing and extending it's range to the north. However, it has undoubtedly suffered in some areas due to competition with European Starlings for nesting sites. The IUCN currently lists the Red-bellied Woodpecker as a species of "Least Concern". Additional Photos: Click on the image chips or text links below for additional, higher-resolution Red-bellied Woodpecker photos. South Dakota Status: Uncommon permanent resident in the eastern half of the state, casual in the west.